Ben Camey Wallace was born on 10 September 1974, in White Hall, Alabama, USA. He is a retired professional basketball player, best known for being one of the best defensive players in the National Basketball Association (NBA) during his prime. He played for various teams including the Washington Bullets/Wizards, Orlando Magic, Chicago Bulls, Cleveland Cavaliers and the Detroit Pistons. During his career in basketball he acquired a significant amount of net worth. 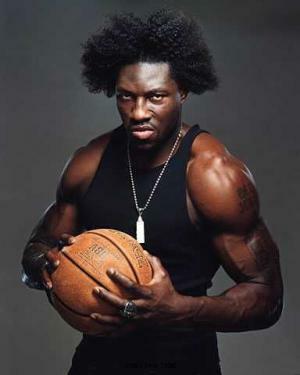 How rich is Ben Wallace? As of early-2016, sources estimate his net worth is at $50 million, mostly acquired through his successful career in basketball, as he signed high-value contracts during his time in the NBA. He also worked on video games, had a few endorsements and even had a sneaker to his name called the “Big Ben”. All of these helped in raising his wealth. Ben started his love for basketball attending Central High School in Hayneville, where he also played baseball and football. He received all-state honors in the three sports, and his mentor Charles Oakley would later recommend Wallace to play with the college Virginia Union. Ben however started playing college basketball at the Cuyahoga Community College in Cleveland, showcasing his defensive prowess. After transferring to Virginia Union, he became part of the Panthers and helped the team get to the Division II Final Four on a 28-3 record. He went on to achieve multiple awards and All-State honors, but was undrafted in the NBA after his graduation, so Ben went to try-outs in Italy for the team Viola Reggio Calabria. Ben later signed with the Washington Bullets/Wizards during the 1996 season, but barely played. The following year, he started with more minutes but did not average much except for blocks. He continued to play until 1999, when he was traded to the Orlando Magic, where he became a starter and averaged 8.2 rebounds and 1.6 blocks for the team. The Magic failed to make playoffs and he was then traded to the Detroit Pistons, where he would really become noticed. The Pistons didn’t make the playoffs during the 2000 season but Wallace averaged 13.2 rebounds and 2.3 blocks per game, improving in the 2001 season when he became the leader in the league for both rebounds and shot-blocking. This allowed him to become the NBA Defensive Player of the Year, assisting the Pistons to make it to the semi-finals of the playoffs before losing to the Boston Celtics. In 2002, Wallace would get another Defensive Player of the Year Award, and the team would now reach the Conference Finals before losing to the New Jersey Nets. Finally, during 2004, the Pistons would become an even stronger team with new acquisitions, defeating the New Jersey Nets, the Indiana Pacers and then the Los Angeles Lakers to win the NBA Championship. They returned to defend their championship the following year, but lost in the Final to the San Antonio Spurs. Ben’s final season with Detroit would be in 2005, reaching another Defensive Player of the Year Award but struggling in the playoffs against LeBron James’ Cleveland Cavaliers. They eventually lost to Dwyane Wade and the Miami Heat. Wallace went to free agency, and signed with the Chicago Bulls. His averages were lower at this point, but Chicago still managed to reach the playoffs before being defeated by Miami. During these years, Ben was selected for the All-Star Game in 2003 to 2006, the ultimate accolade for an NBA player. During 2007, Wallace was traded to the Cleveland Cavaliers. He played with the team as a power forward, but was traded in 2009 to the Phoenix Suns. He then returned to the Pistons for three seasons, and then retired in 2012. Wallace has been married to Chanda since 2001, and they have three children. He has mentioned that he enjoys professional wrestling and some his favorite wrestlers include Hulk Hogan and John Cena. Ben has been arrested a few times due to Driving Under the Influence (DUI) and carrying a concealed weapon. 1 It feels good to just play in the All-Star Game. To be the first un-drafted player to start, I think it speaks volumes for those guys trying to make to the league that there are always opportunities if you just stay prepared. 2 [on how he decides to wear hair] "Whatever my wife feels like. That's the method to the madness." 3 [on feeling pressure during an All Star Game] "Given the opportunity I'll let my defense shine. The All-Star Game is about going out and having fun, it's more for the fans. Whatever happens, happens." 5 Children: Sons Ben Jr., Bryce, and Daughter Bailey. 7 Named NBA Defensive Player of the Year for the 4th time in 5 years. 8 Traded from the Wizards to the Orlando Magic in 1998 along with Tim Legler, Terry Davis, and Jeff McInnis for Issac Austin. 9 Traded from the Magic to the Detroit Pistons in 2000 with Chucky Atkins for Grant Hill. 10 Signed as an undrafted free agent by the Washington Bullets (now Wizards) in 1996. First undrafted player ever to start an NBA All-Star Game (in 2005). 11 Played college basketball at Virginia Union University, a small, historically-black college in Richmond, Virginia. Led VUU to the CIAA Final Four his senior season in 1996, averaging 14 points and 12 rebounds per game. 12 Has won Defensive Player of the Year 3 times in the last 4 years. 14 He trains, works-out, and excercises with Pistons teammate Darko Milicic. 15 He is one of only four players to lead the NBA in both blocks and rebounds in the same season.